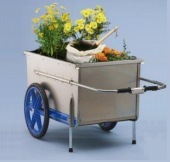 Garden Supply: Fiskars drip and soaker irrigation parts, gloves, folding garden carts, Cyr Smith copper sprinkler sculptures, rotating copper sprinklers and clearance items. BEST BUDS® Garden Supply, Inc. Check out the case prices on many of our drip and soaker irrigation products. Stock up now on many of the items you need for watering system maintenance. Shop our site for drip & soaker watering supplies, rotating copper sprinkler sculptures, clearance items and more. Clearance sale items are offered while supplies last.